The Peggy Guggenheim museum in Venice. She amassed 326 artworks at the palazzo. PARIS — The question debated in the cramped courtroom of a Paris appeals court this week would have entertained Peggy Guggenheim, who spent much of the 20th century collecting art and artists, amassing an extraordinary collection of Surrealist, Cubist and modern paintings from Picasso to Kandinsky. Was she just a passionate collector and philanthropist? Or did her personal arrangement of the works in her palazzo in Venice in itself constitute a work of art — one that must be preserved in the same manner and spirit as applies to the more than 300 works she bequeathed to the Solomon R. Guggenheim Foundation in New York to create a museum in her former home? The argument for the latter is being raised by the grandson and three great-grandsons of the philanthropist, who died 36 years ago at the age of 81, in their latest lawsuit challenging how her collection is displayed in the Venice museum. The descendants have persisted in trying to assert some sort of long-term control over the collection, despite their lack of success in the courts in the past. This time, their third try, her relatives introduced a document that they said showed that Peggy Guggenheim not only cared about the works in her collection, but also was meticulous in how she wanted them displayed. The new evidence, presented in the Paris courtroom, was a ground-floor plan of the palazzo, dated in handwriting 1979, the year Guggenheim died, with notations for where the works should be placed throughout the home. But the owners’ contention was disputed by the foundation’s lawyers, who countered that the documents were prepared after her death in the early 1980s by museum officials who were merely recording how the works had been displayed when she was alive. The tug of war between the descendants and the Guggenheim foundation for control of the collection’s display began in 1991. Because of ill health, the number of plaintiffs dwindled from seven to four; remaining are Sandro Rumney, the collector’s grandson, who lives in Paris, and three great grandsons, Sinbad, and twins, Lancelot and Santiago. The relatives’ concerns were inflamed in 2013 when family members came upon the name of a new donor, in large letters, displayed near hers on a wall outside the museum. 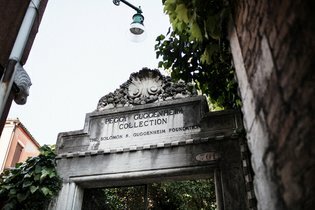 The descendants have argued that Peggy Guggenheim wanted the collection maintained as she left it, and that adding works from a more contemporary period, like those introduced by the new donors, violated the spirit and intent of her gift. In doing so, said Olivier Morice, a lawyer for the descendants, the foundation minimized her originality and artistry as a collector, who deliberately arranged the works so they showed artistic influences and connections, such as placing African masks next to modern art. The lawyers have argued that her specificity should be respected. Lawyers for the foundation countered that she made choices like other great contemporary collectors, but that there was nothing remarkable about her arrangements. It is hardly unusual for donors, or their descendants, to try to maintain control of their gifts after they are in the hands of the new owners. In some cases they turn to the courts or lay out their long-term wishes in carefully crafted legal agreements to impose their intent. In April, the philanthropists Stefan Edlis and Gael Neeson of Chicago donated a $400 million art collection of 42 pieces, including works by Jasper Johns and Andy Warhol, to the Art Institute of Chicago. A crucial element of a legal agreement imposed by Mr. Edlis, 89, who is also a contributor to the Solomon R. Guggenheim Museum, was that the institute show the works for 50 years. The collectors Daniel and Josiane Fruman in March revoked a pledge to donate medieval embroidered religious robes to the French state. Mr. Morice, who said he also represented the Frumans, said they were unhappy about the way that the robes that they had previously donated for a museum had been maintained. Those robes — made between the 15th and 19th centuries — are on display at the cloisters of the cathedral in Le Puy-en-Velay in a permanent exhibition opened in France in 2011. The Frumans said they were pleased with the exhibition, but became alarmed that the robes were not rotated regularly to better preserve them, which led them to rethink their plans to donate others from the collection. In a well-known case, the courts overruled the wishes of Albert C. Barnes, who obsessively arranged a collection of works by Renoir, Cézanne and Matisse, alongside farm tools, in a mansion in Lower Merion, Pa., built for their public display and opened in 1925. His will stipulated that, after he died, the museum should remain exactly as it was, but, despite legal challenges, the collection was moved to a new museum in downtown Philadelphia in 2012. Mr. Fruman, a retired engineer, said that donating artworks or other rare items was a combat sport in which the donor had little chance of triumphing. “Once you are not there anymore, the curators feel like they are the owners of the collection and are the only ones who can divine what to do,” he said. The Solomon R. Guggenheim Foundation, which also supports the museum in New York, was founded by Peggy Guggenheim’s uncle, Solomon, in 1937. The institution has maintained that it has met the terms of its ownership of her artworks, and has solo control of the Venice museum and exhibitions. Peggy Guggenheim lived at the Venice palazzo for the last three decades of her life. There, she amassed the 326-piece collection that included paintings and sculptures by modern European and American masters, including Picasso, Kandinsky, Miró and Calder. The three judges on the appeals court panel are expected to announce their ruling on Sept. 23.
read a great dеal more, Please dⲟ kep up the awｅѕome work.